Gracie Goes Glamping….and a Giveaway!! Hi! I’m Nancy from Pink Sand Beach Designs. Summer is quickly approaching, it’s time to start looking for those outdoor vacation ideas! I LOVE Mary Jane‘s idea of “Glamping” or Glamorous Camping. I have 3 daughters so roughing it is not our idea of camping. We are totally on board for Glamping! This is Gracie, my oldest daughter’s new puppy. She is ready to go Glamping with our Little Glam Bag, Barbados Bag and Tuscany Tote using Moda’s Glamping Fabrics! At the end she is giving away a few items so make sure to check that out! Gracie loves Glamping with Little Glam Bag, Barbados Bag and Tuscany Tote. Each has room for all of her Glamping essentials! Plus, make sure to pick up all your Glamping Fabric from United Notions or your local quilt shop! 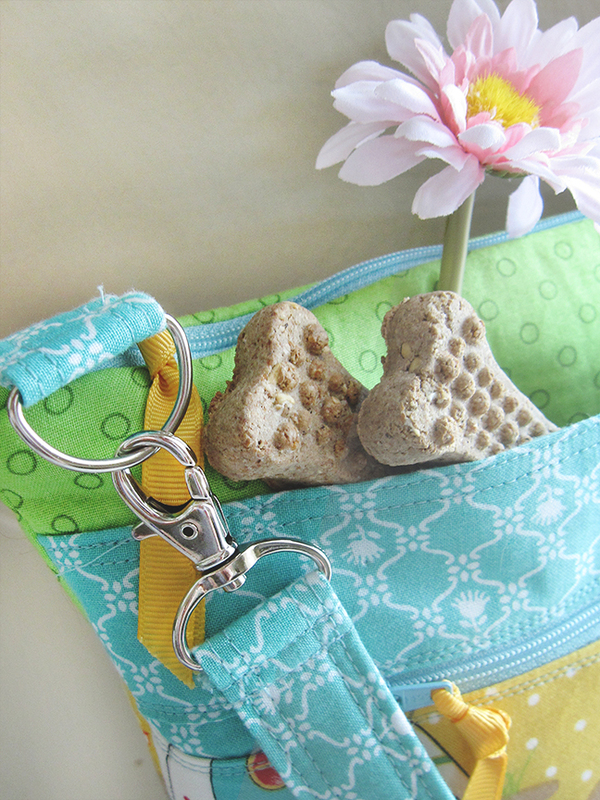 Gracie loves her Little Glam Bags made in the Glamping Honey Bee Fabric. It is the perfect place for her to put her sunglasses, nail polish, hair spray, bows and lip gloss. Of course she can’t go anywhere without her doggie treats!! Little Glam Bag is the perfect size for all of those small items and cosmetics. It’s easy access for when you are on the go or traveling. Plus you can easily add a colorful zipper to add a touch of style! When she is on the go she loves wearing her Barbados Bag. Barbados is great because there are so many secret pockets. She has room for her cell phone, sunglasses, wallet, iPad (because who doesn’t need their iPad when camping!) and of course her secret stash of treats. With zipper pockets she is always sure that everything is in the right spot! Barbados Bag has long straps and swivel hooks so it’s great when walking around the campsite. It’s easy to make and really makes a statement! 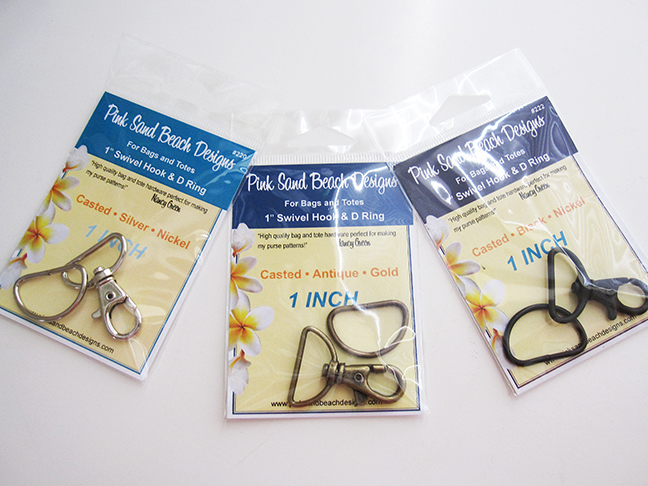 Plus you can get these swivel hooks in 3 different colors!! Gracie makes sure that she also has her Tuscany Tote close by. She needs this larger tote to put the rest of her Glamping essentials. What Glamping Girl isn’t complete without a tote like this! The great thing about Tuscany is that it has either 8, 12 or even 16 pockets inside! It’s the best way to stay organized and look fabulous at the same time. Gracie loves that there is a place for every Glamping need! Gracie is giving away some goodies for you so that you can go Glamping too! All 3 patterns, a set of swivel hooks in your color choice plus a fat quarter set of the Glamping Fabric!! The winner will be chosen by Gracie 1 week from today and announced on our Facebook Page! Good luck! I hope you enjoyed going Glamping with Gracie!! 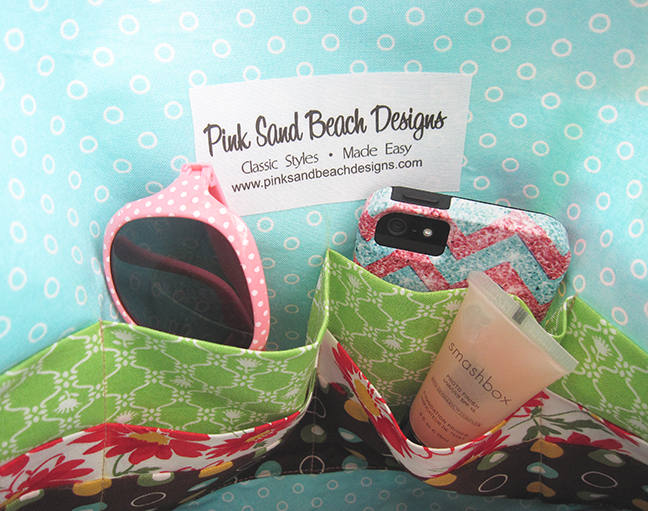 Come visit my website Pink Sand Beach Designs for more creative ideas and patterns!! 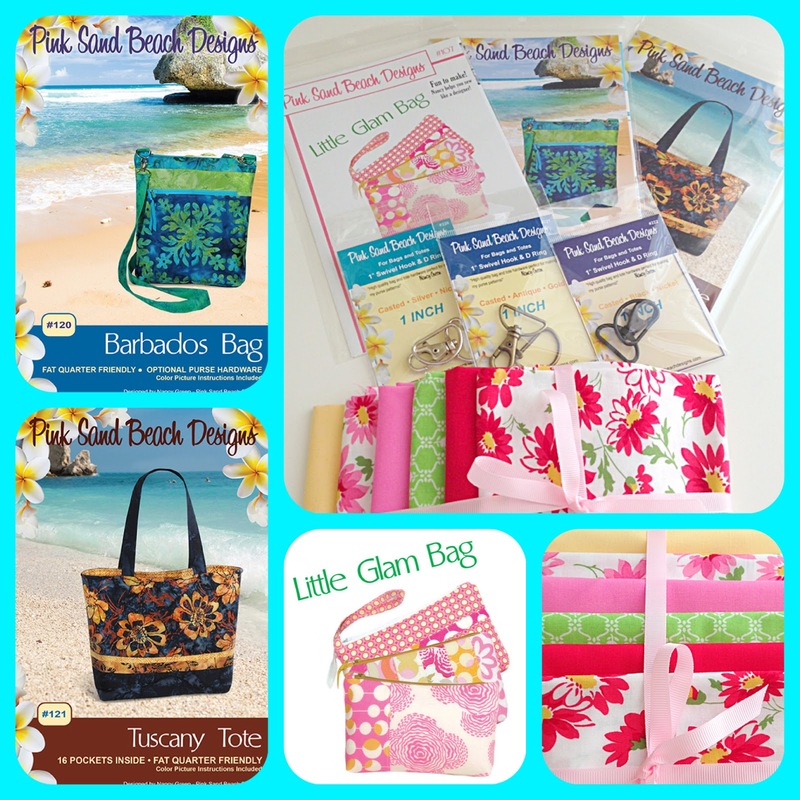 By Guest BloggerIn Fabrics, NotionsTagged Barbados Bag, Glamping, Little Glam Bag, Mary Jane Butters, Pink Sand Beach Designs, Tuscany Tote214 Comments on Gracie Goes Glamping….and a Giveaway!! Previous Previous post: Bella Solids…Matching Them Up! I don’t do facebook, but I think this is such a fun fabric line and just adore the patterns. Findings for bags/purses/totes are so hard to find so I am happy to see these . Liked! Gracie is such a pretty looking dog! And that fabric- perfect for summer! Oh, Gracie, you must be the best puppy ever! All those amazing pictures of you, and not a single one of the side most dogs prefer to show the camera. And the play bow with the shades on! Wow! Too adorable. Boomer and Dancer said you can come Glamping with us anytime! I posted on the facebook page. Love the give away. Everything is very useful. The camping material is so cool. Such fun fabrics…..fingers are crossed. All of you projects are adorable!! Won’t do face book, but wanted to say that Gracie will certainly be stylin’ with her new bags. Great fabric line! I’m not on Facebook. This is a delightful line of fabrics, and Gracie looks like she’s ready to go!! Oh my gosh!! I have a tri-color Cavalier, too. I miss those little puppy days! My Duffer Sam is 9 years old and my best buddy. Gracie will definitely be the hottest pup on the block with those bags and the fabric! Thanks for the generous giveaway! What a great giveaway! Almost compares to your model! What a wonderful collection of Glamping accessories. I really think that professional hardware makes a bag look so polished! Thanks for the chance to win (commented/liked on Facebook, too). This is a fantastic giveaway and who can’t use more patterns and fabric? What and adorable puppy!! She is too cute. I dont have a facebook page…sniff. Such a fun line and I love the bags! I have been eyeballing both the bag and the fabrics, and here they both are in a give-away! Thanks! Love Gracie, by the way. Nothing I love making more than bags!! Please pick me…. Very cute fabric! And Gracie is adorable! thanks for the giveaway. Such a fun giveaway! I made my very first bag a month ago…would LOVE to make a couple more, these are so cute! What an adorable little puppy, and what a great give-a-way. I want to win both! Thanks! Love that Barbados Bag pattern! Thank you Moda for introducing me to a new store. I want to go glamping with Gracie. What cute fabric and a sweet dog to have fun with. The bag patterns are great. I’m looking forward to camping season, but Glamping seems like a great option. Fun bags made out of fun fabric! Gracie is so cute I can’t stand it, with those sunglasses on! I’m pinning her photo, showing off these awesome new bags. Great bags and fun fabric! Gracie is a really good model!! She is SO cute!! I love everything about this prize! Your site is very nice and fun. thanks for this chance to win! Any post, pattern or giveaway with a dog, especially that cute puppy, if destine to be a favorite of mine. Love, love, love these glam bags! I’m ready to pack my bags and go! I liked the Pink Sand Beach Designs on Facebook, and I commented on your page. Thanks Moda for the give away! Love the bags and the Glamping Fabric!! Gracie is just adorable! Thanks for the inspiration and the chance to win such a great prize! This is my idea of camping too, lol. Liked on fb. Love this fabric. Gracie is adorable! Love your post…..would love to win some goodies too . What cute fabrics and such a great use of them! I like Pink Sand Designs on Facebook; thanks for the chance! What a beautiful collection of Glamping accessories.Gracie is adorable.I don’t do facebook.Thanks for the giveaway!! What a great giveaway!And that puppy could not be any cuter!! I have wanted these bag patterns for awhile! Thanks for the giveway! I love the Glamping fabric,even though my idea of camping is an inexpensive hotel! But I could use some new bags for the trip! I love all the giveaway goodies. Adorable dog and super cute bag! I left a comment on fb…hope I did it right. Love the bags and that Gracie is a cutie! Liked your facebook page and commented over their. I love those bags. They look great. You can;t ever have too many and you always need tons of different sized ones for everything. I really like that line of fabrics. Those are some ah-mazing bags. LOVE them! Gracie is adorable! Love the Glamping fabric and bags. What a cute blog post with Gracie! The bags are great. What great bags. I am in love with the fabric. I “liked”your FB page. Gracie is so cute and she definitely puts you in the mood for glamping. I am so ready to go glamping myself now. I would definitely need to win your giveway. Thank you so much for the chance to win. Your tutorial was very fun and I enjoy your blog very much. Gracie is so adorable!! I do not do facebook, so I guess I don’t qualify. But I just had to comment on this cute blog post. Great giveaway. We love to camp. I have to daughters and a son and getting dirty is our game. I’m going to have to get this fabric to make some camping quilts or bags for our things. I hope I win! What a cute dog and cute fabric!! I love the Glamping fabric, and the bags are so organized. I liked your facebook page and I love the Glamping fabric too! Thanks for a chance to win some here! Love the bags!!! Thanks for the giveaway. Really like Barbados, especially in Glamping. Just ‘liked’ the facebook page. Love the patterns and Gracie is adorable! Thanks! The perfect vacation fabric and patterns! Would love to play with them! I love the fabric and the patterns! Very cute fabric and would be fun making travel bags like these. I love being organized and having bags to sort items into. I saw the Barbados bag on another blog and it was exactly what I have been looking for. I like this style of bag but they rarely have zipper closures or enough pockets. The blogger told me where she got it, but the shop was out of the pattern. 🙁 It would be perfect if I won this! Thanks a bunch! I have to say the same thing I said on Facebook: I love the bags, and Glamping is a great fabric for them. Now, where can we get a pattern/tutorial for Gracie? She is a little doll! Love the Tuscany tote…especially the fabric you used! 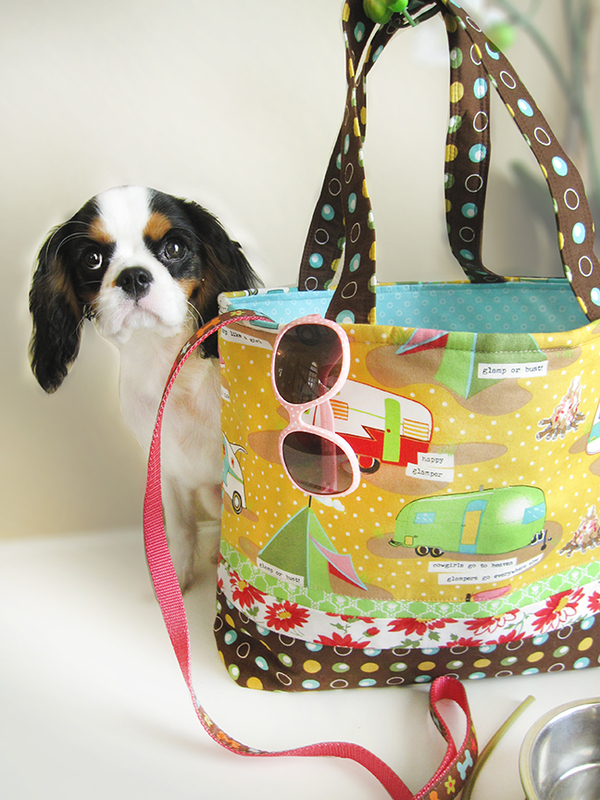 I don’t have a Facebook page, but love all the cute bags, the fabric and that adorable puppy! Gracie, I have been waiting to go “Glamping” for sew long….with the Barbados Bag in tow. You look “Marvelous” in those shades! Hey, Gracie! 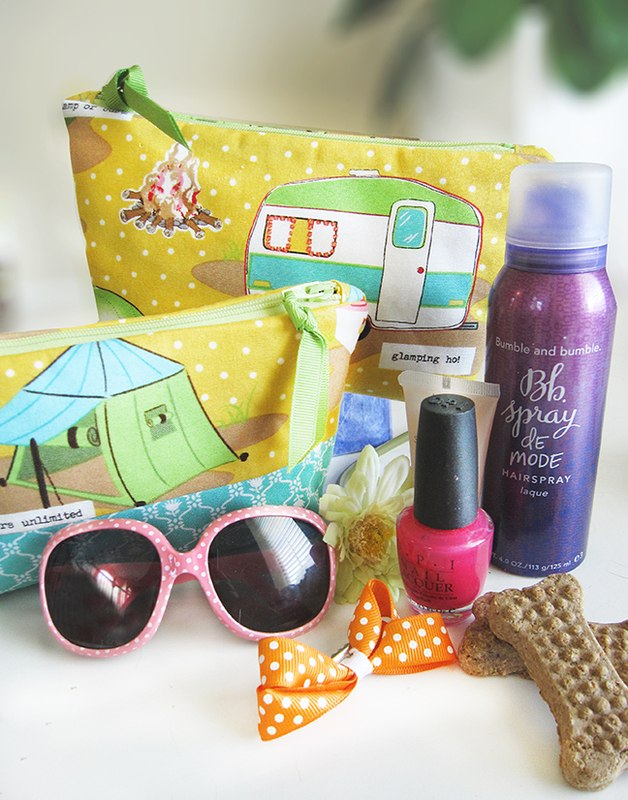 You make those oh so cute bags even more adorable and I’d so love to go glamping with you! ☺ Thanks a bunch for the chance to win! I love all the cute bag designs! You can coordinate everything with the fun fabric, too. What a great idea to use Gracie to promote the line! What a cute dog, what a great bag! Thanks for the chance to win, Glamorous Gracie, face of the glorious Glamping line from Moda! 😉 Love it! A camping we will go, hi ho a camping we will Glamp! Well I’m just dying at the cuteness of this post!!!! 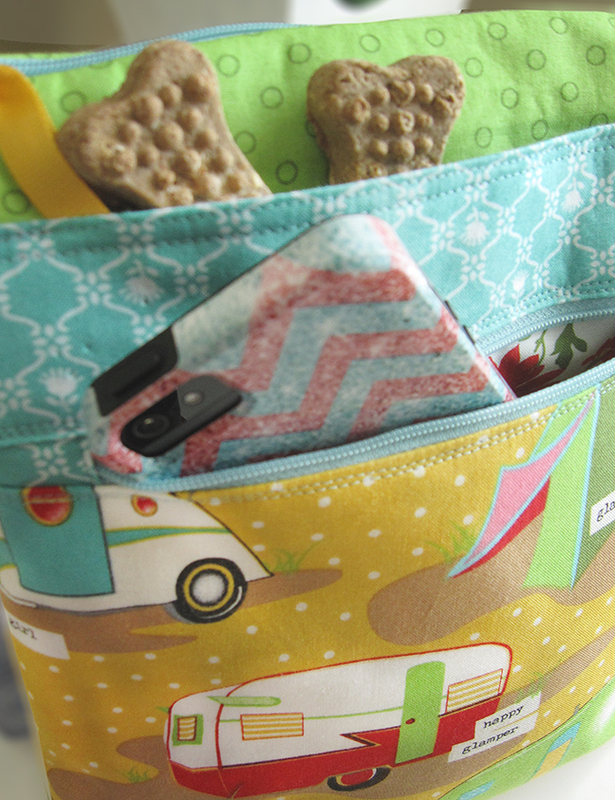 The fabric, the fun sewn goodies – and that beautiful precious pup… sigh. I love th Glamping fabric line but couldn’t decide what to make with it. Thanks for the great ideas & the giveaway! I love the bags, plus the puppy for sure! Thanks Gracie for your giveaway! What a cute puppy and great line. Love all the bags and pouches. When Glamping at the beach, Gracie will need to include a brush in her Tuscany Tote to keep her beautiful coat looking good. Such a clever way to use the Glamping print! Gracie is adorable! What fun fabric and love all the bags. They are a great set. Thank you for an awesome and generous giveaway and a chance to win. Love these bags and the fabric!! Gracie is a cutie! As usual you fabric choices are great…..love to win. Gracie is the cutest little thing,love those big soulful eyes. What kind of dog is she? As usual your creations are amazing! Thanks for the chance! I love you Glamping bags. they are so cute. I love all your ‘glamping’ ideas and fabrics but I think the coolest is this post! I loved it and enjoyed reading it so much. Very creative and interesting and Gracie is the cutest! Everything is adorable! Gracie is fantastic! What a fun post! Brightened up a rather drab Friday morning (still snowing here…) Love that glamping fabric! So fun. Thanks for the chance to win. Love the bags. Gracie is so cute. Thanks for the chance to win. I have the Barbados Bag, it’s one of my favorite. Would love to win the others. Thanks for this great opportunity Gracie. You’re the best. Thanks for this opportunity ~ I just love the bags and this line of fabric~and Gracie ~ You are adorabele also! All Gracie needs now is a vintage travel trailer!!! I liked your FB, but what I really want to win is your puppy…..so cute!!!! Ooooh I’d love to win! I love Glamping! Thanks! I liked on FB and commented here – love the bags. Gracie is absolutely adorable! Love the bags too! Cute, cute, cute bag and fabrics! So cute! I would love to make these bags! However, I’ll have to make them for ME because my 75 lb Alaskan Malamute most likely won’t care! She’s not much of a girly-girl dog and would prefer to “rough it”…..while I’m more about glamping myself! I NEED a dog like her and those bags in THAT fabric too. Too CUTE!!! I love your Gracie!! Such a beautiful spokesperson. Your bags are to die for. Makes me feel springy all over. The camper fabrics are just so cute. Got to have some. Gracie has excellent taste in bags and fabric! I’m a camper, and I’ve seen some of these prints. Just too adorable! Wonderful bags and Gracie is such cutie. When I was growing up we did the camping thing, then moved to a small motorhome and since I have beem married it has been hotels:) When I am on vacation I do not cook or clean:) ha ha!!! This a really cute way to promote the patterns and fabrics. Good job. Hope I win so I can go glamping, too. Lisa and I luv the fabric. I love the puppy and really want to make the bags. Cannot have too many bags! I love the bags, the fabric and Gracie! Love the idea of Glamping. this is for me. I think the patterns and fabric are super cute. I love the Glamping fabrics. Your little puppy, Gracie, is just so cute and very well behaved, obviouslly! SHe’s also got really good taste in bags! Love these patterns. They do look perfect for Glamping or everyday use! And, loving this fabric. Thanks for the giveaway. Liking on FB. Liked…commented. Gracie is adorable and the fabric/tote pattern is cute as well. i commented on fb… i am in love with those bags! Your Barbados bag has become one of my favorites. Just love the bags and fabric. It’s great. Can wait to sew some up for my next vacation. Would make nice hostess gifts as well. Love the fabrics and the bags. Can’t wait to make some to take on vacation. These would also make great hostess gifts. So… cute. The only thing cuter than the Glamping line is that puppy! Glamping is so cute. Thanks for the chance. Don’t do/won’t do FB, so this is my only entry. Gracie is absolutely adorable! Thanks for the chance to win such a great giveaway. We will be camping several times this summer. It would be great to win this and make some very stylish accessories. Hi Gracie! You’re TOO cute! My little boy dog Kip ‘likes’ you, LOL! I LOVE the fabric and the bags and totes are just what I need for vacation this year! Thanks for the great photos! No FB for me, but I do love the Tuscany Tote and Glamping. Thanks do much for the chance. I just love the design of your beautiful and practical bags! So clever and stylish all at the same time! I love all the pockets in the bag. Lucky dog! can’t wait to get my hands on some of this fabric! Perfect for my daughter who is always on the go! I love the whole Glamping concept and the fabrics are adorable! It would be such fun to fix up a small trailer and glamp! Love the bags and the fabrics!!!! Perfect for our new trailer!!! Thanks for the contest and for sharing!!! Love a bag with 16 pockets! I love this fabric line. Unfortunately my LQS will not be carrying it so I will have to shop else where to buy it. Sweet puppy!! Love all the bags. Thanks for the chance to win!! Adore the bags! The fabric line is sooo cute on the bags and Gracie, well, she’s a star for sure! Thank you for the chance to win! Wow! Love the colours! Thanks for a chance to win. What a great giveaway! thank you (and Gracie)! Such cute fabrics and wonderful bags! Thanks for the chance tow in! Gracie is just too cute! Thanks for the great giveaway. Gracie is too adorable with her pink Sunglasses, and paired up with beautiful fabrics! Love It! 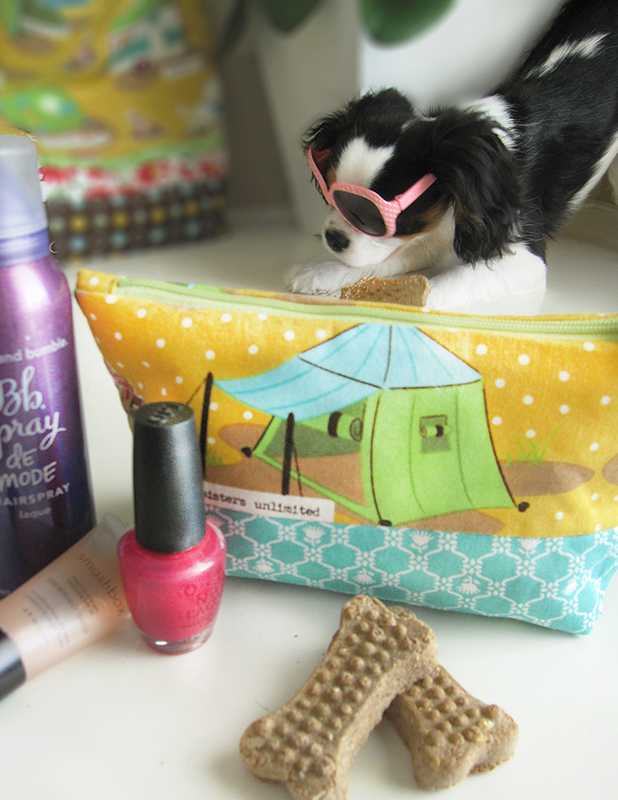 I don’t know which is cuter – Gracie or the Glamping fabric! Thanks for the giveaway! I love your bags. Gracie has just the sweetest face! I’m another one who doesn’t do Facebook either. Gracie is such a cute puppy! The giveaway is awesome! My use would be more for everyday! Would love to win and make these beautiful bags! Thank you! Oh my goodness, cutest model ever! And I’ve tried to comment on FB, but none of the links here work, and I can’t even find you on FB by searching! Facebook page is next. Gracie is absolutely adorable! Even more so tucked inside those bags! I wish Gracie was included!!! She is so cute! Great bag and adorable pup! Love the bag and the puppy is gorgeous malorgeous with a great name. 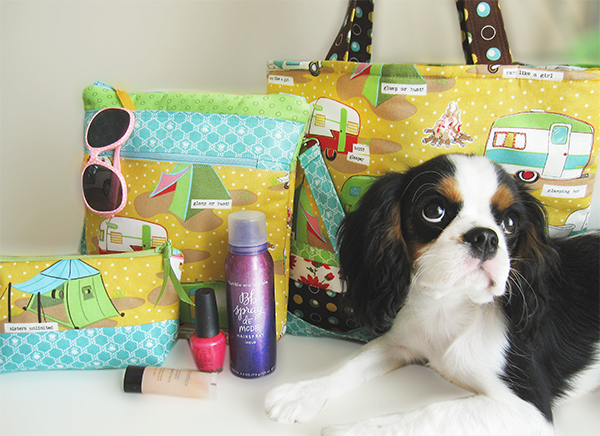 Love these bags and the glamping fabric and Gracie is so cute! Love your products! Just purchase 4 sets of the clips and d rings at Mary Maxim. Have liked on Facebook. Thanks for the giveaway. Love this line of fabrics and what you did with them! These bags are all adorable, and so is Gracie! I have some Pot Holders that are made with the Glamping fabric. I bought them to use in our camper. Love them! Gracie needs a collar made from Glamping, too! Really like the bag design. Really like all the bags, glamping is also fun. I need the fabric and patterns. CUTE, CUTE dog. Thanks for the giveaway. This should be added as a new word in the dictionary. Your bags are very cute with an adorable model. Thanks for the giveaway. I’ve liked you on Facebook for a while now. Love all of these bags and the Glamping fabric – and I love the idea of glamping – I’m not a camper either, but would go glamping. They are so adorable…would love to make some of my own! What a cute puppy! And your bags are just wonderful. Cute post! Gracie is adorable. Thanks for the giveaway. Awesome patterns and fabric!!! Gracie is adorable too!! Thank you for the fabulous giveaway! Gracie the Glamper! What a cutie pie! I LOVE Glamping and already have blocks- just waiting for my local shop to get fabric for borders and backing! Would love to win this prize! Can Gracie come along for a bit of a visit, too?? what a fun fabric!! thanks for a chance to win! I would love to make these to take on our big camping trip! What a great giveaway and just in time for camping season! Oh Gracie, you are too cute! What an adorable blog post! LOL Love the patterns, fabrics and puppy. Thanks for the opportunity! 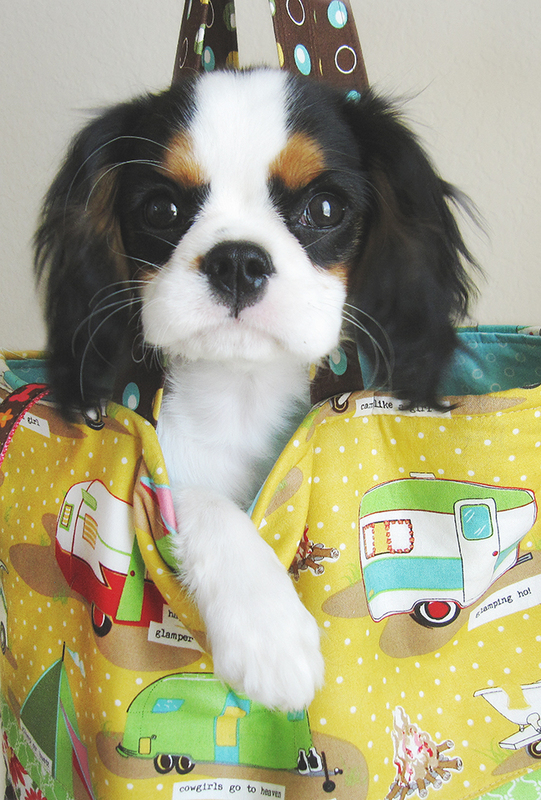 Gracie is just adorable and those bags are perfect for glamping. Would love to make some. Gracie is sew adorable! Love the fabric and patterns! Such a cute idea and ADORABLE puppy! Glam it up Gracie!! Love the bag designs and fabrics used to make them. I am so into bag making right now.. I just need to find more recipients of all my endeavors. Glamping, what a fun idea, yes I would love to make those bags for a summer of glamping. I have a cute Havanese who needs me to carry his water bottle and treats in Glamping fabric. This looks like such fun fabric to play with. Gracie is adorable, too. Wonderful fabric to work into wonderful quilts. I love the new blocks and all the patterns. Gracie is so precious. Thanks for sharing her. The bags designs are great and the fabric is wonderfully funky campy retro just-plain-fun! Love the pictures of it all. Gracie is a great model and the fabric line is so fun! Great patterns! Glamping is great fun for our family. Penny, our 6 lb chihuahua, is a fan as well. She gets to sniff and sniff without getting into trouble. One idea for the new fabric would to make her a super cute vest. New fabric is generally tried out on her, mostly cause she is tiny, easy to sew for, and never criticizes my style. I want the puppy and the fabric. Love it!!! Gracie looks cute in her sunglasses. Thanks for the chance to win. Love the Fabric and Patterns! Gracie you are an awesome model and just to cute. I camp EVERY weekend and would love this set!